Un: Speed controller with thermostat and remote 4m temperature probe, power cord with IEC-plug. 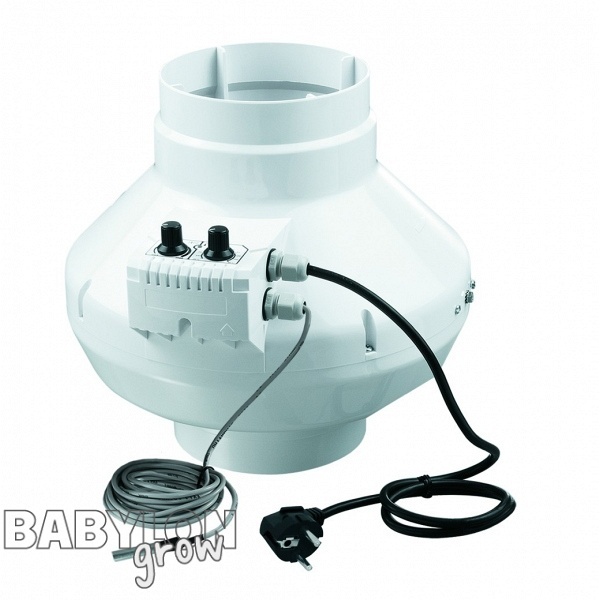 VENTS VK fans are applied for supply and exhaust ventilation systems of any hydroponics installations.Compatible with Ø 100, 125, 150, 200, 250 and 315 mm round air ducts. Models marked VK...Q are supplied with quiet motors for low-noise applications. Due to the corrosion-resistant durable plastic casing, these models are the perfect solution for the installation in exhaust ventilation systems of humid premises such as greenhouses etc. The casing is made of high-quality durable ABS plastic. The fans are equipped with waterproof terminal boxes. Models marked VK..R are supplied with power cord and plug. curved blades balanced in two planes.  Overheating protection with automatic restart.  Maintenance-free ball-bearings used with motors and designed for at least 40 000 hours operation. Models marked VKS are supplied with high-powered motors. Motor protection rating is IP 44.